Jovellana violaceae is a member of the Scrophulariaceae family and is located on the Loudon Terrace. This semi evergreen (it can lose its leaves in a harsh winter, for a short time), sub – shrub (it does not get very big about 60mm tall), comes from Chile. It is an upright suckering shrub with lobed deep green leaves. Its flowers are enchanting, being lilac purple with a yellow throat speckled with purple spots. To grow this plant well, it needs shelter from the worst of the weather, fertile well drained soil in full sun. It can be pruned in early to mid-spring by removing the old stems down to within 25mm of the old growth. 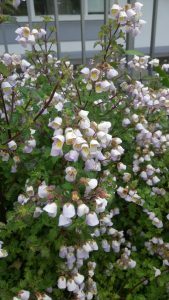 To propagate Jovellana, take side shoot cuttings with a heel from the older wood in late summer, place in well drained gritty compost.